Sturdy and attractive tables and chairs. Delivery and pick up available. Barry’s Let’s Rent It in West Bloomfield is SE Michigan’s leading supplier of tables and chairs for graduation parties, indoor and outdoor weddings, corporate events, and more. Our tables and chairs are clean, up-to-date, and easily enhanced with colorful linens and seat covers. If you have a party or event coming up and you need tables and chairs, shop local! Barry’s can help you determine how many tables and chairs you need to accommodate your guests and your space. Party planning can stressful enough without worrying where everyone is going to sit. And what about the buffet? Why not let Barry’s Let’s Rent It help you plan the seating arrangements and buffet line? We have experience with parties and events of all sizes and kinds, and know exactly where to place the tables to create a logical and smooth traffic flow. When you rent tables and chairs from Barry’s Let’s Rent It, we can help you determine the proper placement of tables and chairs so your guests can easily walk around the party and move from table to table catching up with friends and relatives. If you’re planning to serve food buffet style, we can suggest where to place the buffet line so it doesn’t interfere with the seating. 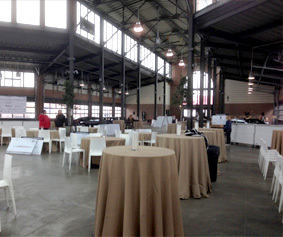 Contact us now for a great price on table and chair rental in metro Detroit. With Barry’s Let’s Rent It, Your Table and Chair Delivery Will Be On Time! Whether you’re hosting a party in your backyard, basement, at a hall, or in a park, if you need tables and chairs, Barry’s Let’s Rent It can deliver them. There’s nothing worse than trying to organize tables and chairs at the last minute. With Barry’s Let’s Rent It, we’ll help you determine how much time you’ll need to set up the tables and chairs and when the best time to deliver them would be. Then, we guarantee our delivery team will arrive at the agreed upon time. If you prefer your tables and chairs, or just chairs, be set up and arranged by a professional, Barry’s Let’s Rent It can provide that service too! 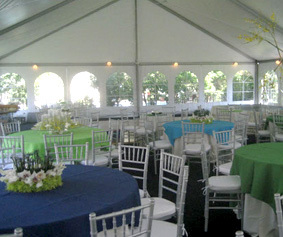 We’ve set up chairs for wedding ceremonies, lectures, graduations and more. Straight lines and uniform rows can be trickier than you think! Barry’s Let’s Rent It is SE Michigan’s one-stop-shop for linen rentals. In addition to our table and chair rental, you can rent beautiful linens and seat covers, in all the latest colors, to coordinate wedding colors, reveal gender at a baby shower, or just look more professionally decorated. With Barry’s Let’s Rent It in West Bloomfield, we’re more than a table rental company, we help complete your party! Our extensive list of tableware rental includes silverware, dinnerware, coffee makers, and more! For more information on renting tables, chairs, and all the place settings to make your table complete, call (248) 855-0480 or download our list of rentals.